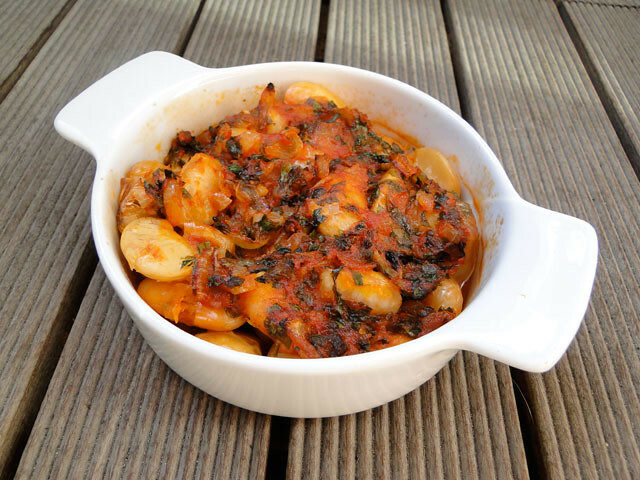 Gigantes sto fourno as know in Greek, is a comforting dish I spotted on a great blog Kalofagas. I love Greek food and Peter always offers us the true taste of healthy, rich flavored, traditional Greek cuisine. Gigantes, also known as elephant beans, or giant beans, are a large flat fleshy legume native to Greece. With respect to ways of cooking recipes for those beans there are many suggestions. In Lebanon we used to serve them as a salad with an olive oil-lemon vinaigrette and eat them with Lebanese bread and onions. The most typical and traditional Greek recipe is baked in the oven with tomato sauce, onion, parsley, spices and aromatic plants. I love comforting food in all it’s many forms, and this is no exception. Soak beans overnight in cold water to cover by an inch or more. Place the beans in a large pot. Add the carrot, celery, bay leaves and garlic and fill the pot with enough water to cover the contents by 1 inch. Bring to a boil (around 15 mn), reduce heat to a simmer and cook for approx. 45 minutes or until the beans are soft (taste one). Take off the heat and reserve (including the liquid). In a large skillet, add your olive oil and onions and saute them on medium heat for 10-15 minutes to soften. Add the tomato sauce, paprika, salt, pepper, parsley and stir in together. Set aside. Using a slotted spoon, place your beans, celery, carrot, bay leaves into a large baking casserole. Now add all of the contents of your skillet to the bean mixture in the casserole. Pour in enough reserved bean liquid to cover everything in the casserole. Mix well and adjust seasoning. Place in a pre-heated 375ºF (190ºC) oven and bake for 30-35 minutes. Remove the baking vessel from the oven and add your dill (I add the dill at this stage so it doesn’t darken too much). Stir to mix in well and place back in the oven and bake for another 10-15 minutes or until most of the liquid is gone and the top is nicely browned. La veille, faites trempez les haricots dans une grande quantité d'eau. Le lendemain, égouttez les haricots. Placez-les dans une casserole, ajoutez les carottes, le celeri, les feuilles de laurier et l'ail. Couvrez-les avec une grande quantité d'eau. Portez à ébullition (env. 15 mn) puis réduisez le feu et faites cuire à feu doux environ 45 mn, ou jusqu'à ce qu'ils soient tendres (goutez un). Réservez avec le liquide. Pendant ce temps, préparez la sauce. Emincez les oignons. Faites-les revenir dans une sauteuse avec de l'huile d'olive. Ajoutez le coulis de tomate, paprika, sel, poivre et persil. Mélangez et réservez. A l'aide d'une écumoire, placez les haricots (avec les carottes, l'ail, le celeri...) dans un plat allant au four. Ajoutez la sauce de tomate. Versez un peu du liquide des haricots. Mélangez et réctifiez l'assaissonnement. Enfournez à 190ºC pendant 30 à 35 mn. Sortez le plat du four, ajoutez la ciboulette. Mélangez et remettez au four pour environ 10 à 15 mn ou jusqu'à évaporation du liquide. A beautiful dish! Those beans are wonderful and so tasty. 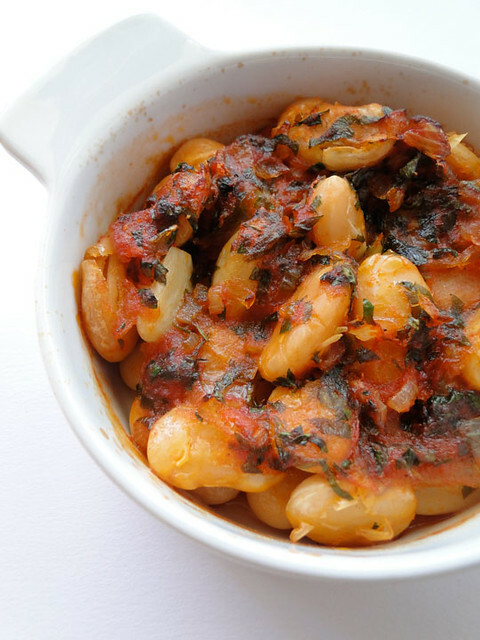 Chico, it's one of favourite Greek dishes and now that the cool weather is here, it's time to make Gigantes again! Comfort foods are great for this time of the year and this definitely fits the bill. We loved these beans when we were in Crete - your version look fantastic! Oh, i love these gigantic beans, I hope I can find them... Your dish looks absolutely amazing, perfect for this weather. I loved this dish when I visited Greece! 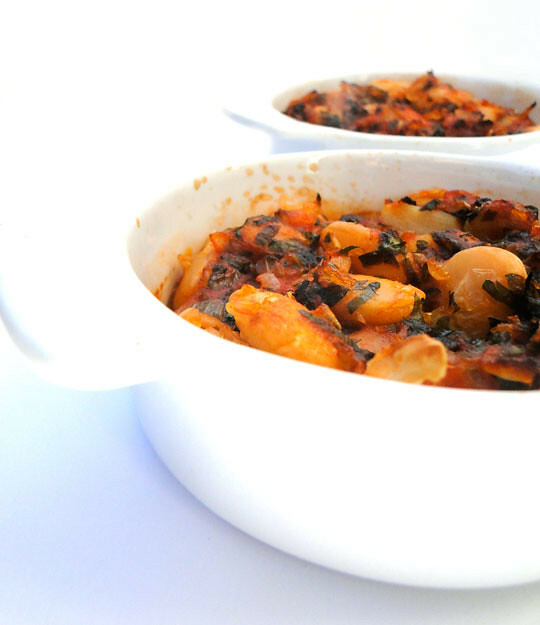 I've never had elephant beans before... this recipe looks fantastic! We had these beans all summer in the Chouf; every little grocer had them in plastic bags to sell from local gardens; I love them and we did indeed make them as a salad. I am sure I would love that version too! I've never heard of elephant beans before until now. This dish looks fabulous and delightful! I don't think I've ever seen elephant beans! That's ok, the flavors sound amazing and I'll sub another bean! This dish looks fabulous and delicious! J'aime beaucoup ce genre de plat mijoté, c'est très bon! What beautiful photos! This looks like something I wouldn't mind snuggling up with on a cold fall day! I love gigantes! You've done them justice here. And great shots! 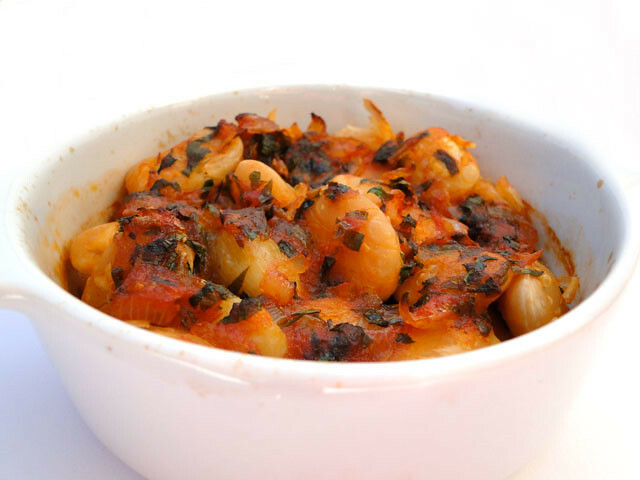 This is a very beautiful and delicious looking bean dish! Those beans are truly BIG! Cherine, I'm behind on your wonderful posts but that's because I was in your neck of the woods for almost a month! Those beans are gorgeous. I've been a fan of Peter's site, too, for a while and I'm sure you did his recipe justice. that looks like a perfect dish for a fall night when it's cold and raining outside. Comfort food at its best. Definitely you have to open a store with all these dishes...I would be your first customer!! i had a dish similar to this at a greek place in Dallas- Love that I finally have a recipe to recreate it! I love how a simple ingredient like beans can be elevated to a superb dish just with the use of a few spices. Lovely stuff.